Terrified mum-of-three Michelle Mason, 39, from Stoke-on-Trent, Staffs, was shocked to discover the terrifying image of a ghostly child, standing just yards from her two children while on a family outing to Cannock Chase, Staffs. 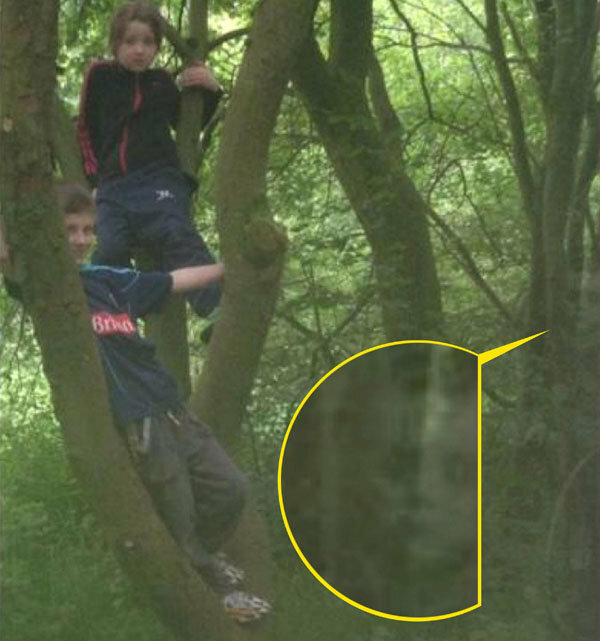 The freakish image, which Michelle took in August, clearly shows a ghostly figure of a Victorian child standing to the left of a tree where Michelle's children, Sophia and Lee were climbing. Michelle said: "We were on a family walk one afternoon and the kids decided to climb a tree. I stopped to take a photo but it wasn't until I got home that I spotted a child's face looking back at me. "I couldn't believe it when I looked closer at the picture and there was a child, standing with a wheel or a hoop in their hand. It has really freaked me out. I don't like anything like that. "I would love to know more about the child in the picture. I am convinced it is a ghost, possibly from the Victorian times. "When you look closely at the photo you can see the deep dark eyes. It definitely bares a striking resemblance to the black-eyed child that has been spotted around Cannock Chase. "I don't think it looks evil though, or like it wants to cause any harm to my children. They were both a bit spooked by it at first, but any child would be." The terrifying plague of black-eyed ghost children have been reportedly spotted up and down the country, including Liverpool, South Wales and most frequently at Cannock Chase, in the Midlands, which is where Michelle's haunting snap was taken. Michelle said: "I would love to find out more about the history of that area and if there are any experts who can help me out. It is a fascinating subject. "I have had a lot of feedback from people, and it is split pretty evenly between people thinking it is a little boy or a little girl. "Different people have spotted different things, such as a hand holding a hoop or a stick. Everyone sees differently I think depending on what they believe". Michelle, a full time carer, said: "Some people have said that I must have used Photoshop but I couldn't tell you the first thing about that, I have no idea how to use anything like that. I just took the photo on our family compact camera. "But that is most likely just people who are sceptical or don't believe in the afterlife, that is always the first thing they say."